Berlin, April 2nd, 2019 – The Document Foundation announces the LibreOffice Latin America Conference 2019, held at the Facultad Politécnica de Universidad Nactional de Assunción (FPUNA) in Asunción, Paraguay on July 19th (Friday) and 20th (Sat). During the conference, we will discuss LibreOffice related business such as supporting and training, migrating to LibreOffice and the ODF true standard format, developing, and any other community activity in Latin America. In addition, we will have guests from the core team at The Document Foundation, which is a charitable foundation and the home of LibreOffice. 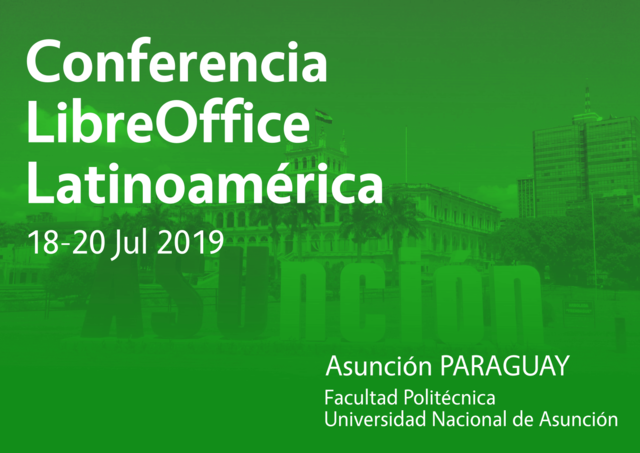 “The event will be an important opportunity for the consolidation of LibreOffice and free open source software in the region, bringing experiences from other countries for discussions and software development in Latin America” commented Alcides Javier Torres Gutt, professor at FPUNA. “FPUNA is proud to host the event for the Paraguayan FOSS communities, as well as advancing in the creation of a real LibreOffice with Guarani user interface”. “The Document Foundation is a global organization, and as such wants to tighten the relationship with local communities in areas like Latin America, where there are huge growth opportunities for free open source software. A conference is the best way of putting together LibreOffice advocates, and sharing experiences and best practices at continental level” said Italo Vignoli, Marketing and Communication specialist at the Document Foundation. Contact the conference organizers at mail address latinoamerica@global.libreoffice.org. ¡Genial! Espero algún día una en Colombia, saludos.